Often we have a need to analyze log to get some information about the application. ELK is the one of the possible solutions for this problem. The basic source of information is HERE. Desktop – user may use web browser to visualize data via Kibana or create a code to interact with elasticsearch via REST interface. Besides installing and configuring all the stuff one needs to remember also about deleting old data in elasticsearch not to exceed disk space – logs can take huge amount of space as you know. I achieved that by creating some crontab started simple Perl script which parses index names and deletes the ones which are older than given amount of days. Automatic maintenance is a must for sure. There is much in the web about Elk so I will not be giving any more details here. I would like to concentrate only on one thing which was hardest and took me longest time to achieve – logstash configuration. The documentation there on the page seems to be rich and complete, however for some reason it was very unhandy for me. Ok, I say more, the authors did the trick and created a page which was almost useless for me. I do not know exactly the reason but maybe it is because of too few examples, or maybe they assumed the knowledge of average reader is much higher than mine. 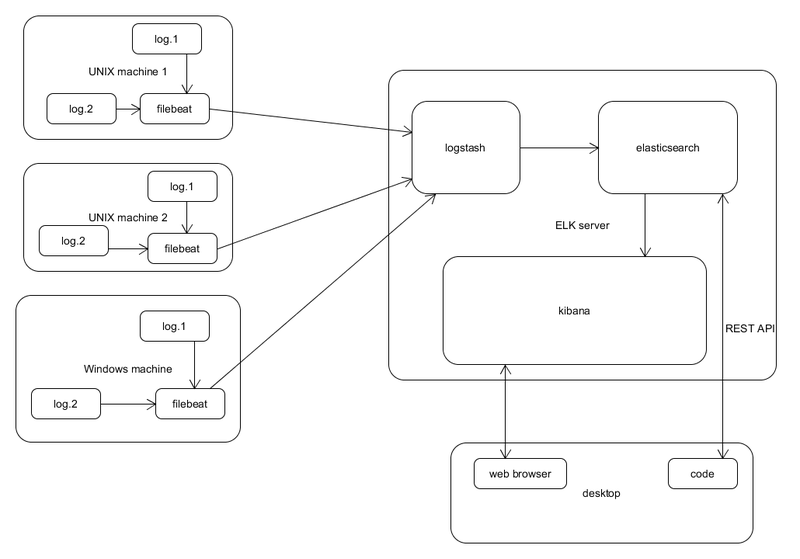 Anyway, I needed really much time to achieve the right configuration for all items and especially for logstash. After investing much effort in the solution I am also experimenting with other usage – not only for log data – to get more value in the project. After regression test suite is run I send surefire reports and test execution logs (this is domain language level) and view them via dashboard which also collects all application log data (server and client) at the same time. This gives consistent view on test run. The interesting ability is also REST interface to elasticsearch. I use it for programmatically downloading the data, processing it and uploading the result back there. This is for the purpose of performance analysis where information in the log files as logged by the application requires processing before conclusions can be made. This ability allows for example of creating very complex automatic integration or even system integration tests, where each component would know the exact state of the other by reading its logs from elasticsearch. Of course we should avoid complex and heavy tests (how long does it take to find a problem when system integration test fails…? ) but if you have a need of creating few of them at least it is possible from technical point of view. Which searches also for things you do not want to find: “log data long”, “log stuff stuff long stuff data”, “stuff long log stuff stuff data” etc. This is really a problem given the need of finding few word strings is very common thing. That’s it for disadvantages. 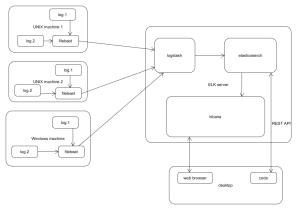 I think ELK does the job of log analysis very well anyway. For sure it is worth to try.